E. Dakota: Sunny So Cal. So I got back late Monday night from the beautiful west coast and managed to not take one picture while I was out there. 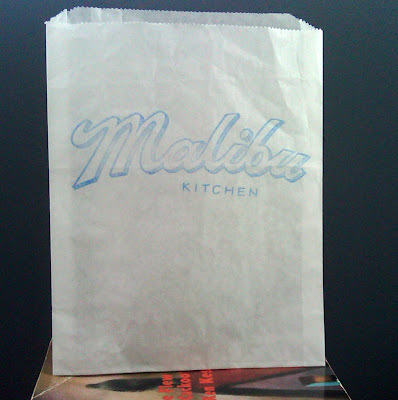 Above is the only little token I have -- a candy bag from Malibu Kitchen in the Malibu Country Mart -- somewhere Libby and I had stopped for a sweet treat after our hike in Solstice Canyon. At one point it was filled with multicolor Swedish Fish and mini Tootsie Rolls, but was emptied quickly as we drove down the PCH. Not a bad way to end your Sunday afternoon if I do say so. It might seem as though this bag was a piece of trash that was left in my bag by accident, but the truth is I carefully placed it in a magazine and tucked it in my carry-on. I just loved Malibu ( I mean, I guess who doesn't ? ) and the old school feel of the Kitchen. It had that special New England deli quality ( my absolute favorite with wooden planked floors, ceiling fans, and screen doors ) that I thought could only be found on the East Coast. Turns out they have them out west too. I love the nostalgia of the hand stamped bag and the jars of candy they had to choose from. All of the Country Mart had clean beautiful wooden floors and felt fresh and not like an outdoor mall (which it is). All weekend I couldn't get enough of taking in the beautiful scents of flowers and trees blooming everywhere. Not to say they aren't on the east coast too, but something smelled better out there. So much so that I tried to go for a run Monday morning in West Hollywood, and had to slow to a walk because I was breathing so deeply though my nose as I passed all of the gardens and wanted to soak up every little bit before I got back on the plane. We saw a cheesy wall plaque that said " Problems are smaller at the beach. " And I think maybe there is some truth to that. Whether its a bright blue sky and bright blue water to match, or a muted sea foam green against grey skies the breaking water is so calming. I don't think they call us Aquarius' water babies for nothing.